Cofactor biochemistry is a prerequisite for cellular metabolism. Regulation of cofactor pools and their composition is required for plant development and the response to environmental stressors. Yet, our capabilities to monitor and quantify cofactors dynamically in real time and with subcellular resolution are very limited. The most advanced and promising tools for specific, quantitative, dynamic and compartment-specific measurement of biochemical and physiological parameters are genetically encoded probes that are mainly derived from green fluorescent protein (GFP) and flavin-binding fluorescent proteins (FbFP). Since the advent of GFP as a reporter molecule two decades ago, a multitude of GFP-based biosensors have been developed that can report physiological parameters, including a small number of cofactors. A major limitation, however, is the adaptation of such genetically encoded probes to different organisms as well as their sensitivity to specific cellular and environmental factors. To test the reliability of the probes in living organisms, several considerations are critical, including cell type and subcellular compartment as well as the development of appropriate in vitro calibration routines. 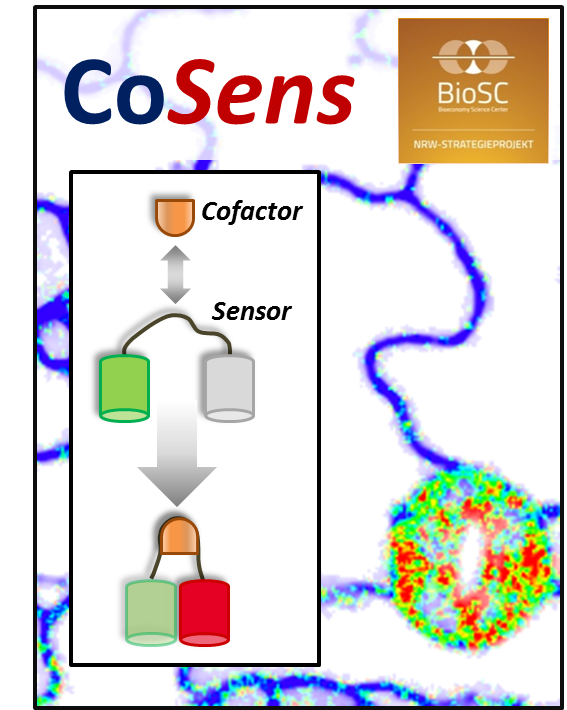 In the course of this SEED FUND project CoSens we adapted existing cofactor sensors to plant organelles and also designed novel probes for a range of different cofactors, such as ATP, flavins, and Fe-S clusters, with central significance for metabolic adjustment in plants. The availability of such in vivo sensors will provide novel avenues for the identification and functional understanding of genes that contribute to plant growth and thus the work done within this project ultimately is expected to contribute to the improvement of plant productivity, stress tolerance and food security. The total budget of CoSens is € 150.000. CoSens is part of the NRW-Strategieprojekt BioSC and thus funded by the Ministry of Innovation, Science and Research of the German State of North Rhine-Westphalia. De Col, V, Fuchs, P, Nietzel, T, Elsasser, M, Voon, CP, Candeo, A, Seeliger, I, Fricker, MD, Grefen, C, Moller, IM, Bassi, A, Lim, BL, Zancani, M, Meyer, AJ, Costa, A, Wagner, S and Schwarzlander, M (2017). ATP sensing in living plant cells reveals tissue gradients and stress dynamics of energy physiology. Elife 6. Moseler, A, Aller, I, Wagner, S, Nietzel, T, Przybyla-Toscano, J, Muhlenhoff, U, Lill, R, Berndt, C, Rouhier, N, Schwarzlander, M and Meyer, AJ (2015). The mitochondrial monothiol glutaredoxin s15 is essential for iron-sulfur protein maturation in arabidopsis thaliana. Proc Natl Acad Sci U S A 112(44): 13735-13740.